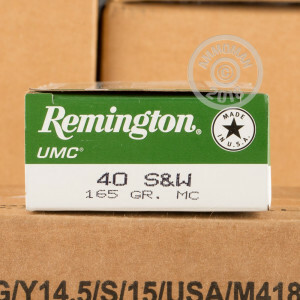 Remington UMC ammo can be found in the guns of many shooters at ranges across America due to its low cost and reliable performance. 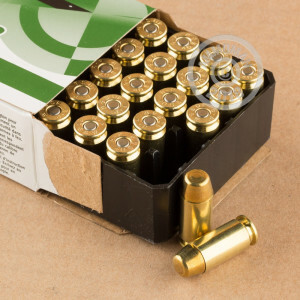 This particular .40 S&W load is a particularly good choice for defensive handgun training. 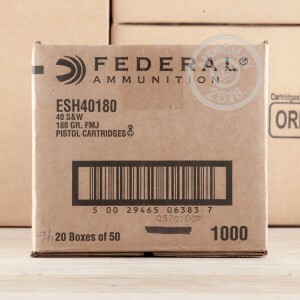 Each round in this 500-round case fires a light 165 grain full metal jacket bullet that delivers external ballistics similar to those of many popular self-defense loads. With a muzzle velocity of 1,150 feet per second, you can expect realistic recoil that will help you get used to the feel of full-power defensive JHPs. This ammunition is loaded in Lonoke, Arkansas using non-corrosive primers and reloadable brass cases. Grab this case at AmmoMan.com and check out our free shipping promotion for all orders over $99!